So what is the stack? Well I hate to use the word in the definition, but it's just a metaphorical stack of bytes; or an abstract data type that serves as a collection of elements, with two principal operations. PUSH Adds an element to the collection. POP Removes the most recently added element that was not yet removed. The stack is primarily used to store values for a process. It uses a LIFO (last in, first out) behavior. So if we PUSH value A onto the stack and then PUSH value B, when we POP it will be value B first then value A with the second POP. So let's just dig in, if we have some code like this. And if we assemble this in some memory. 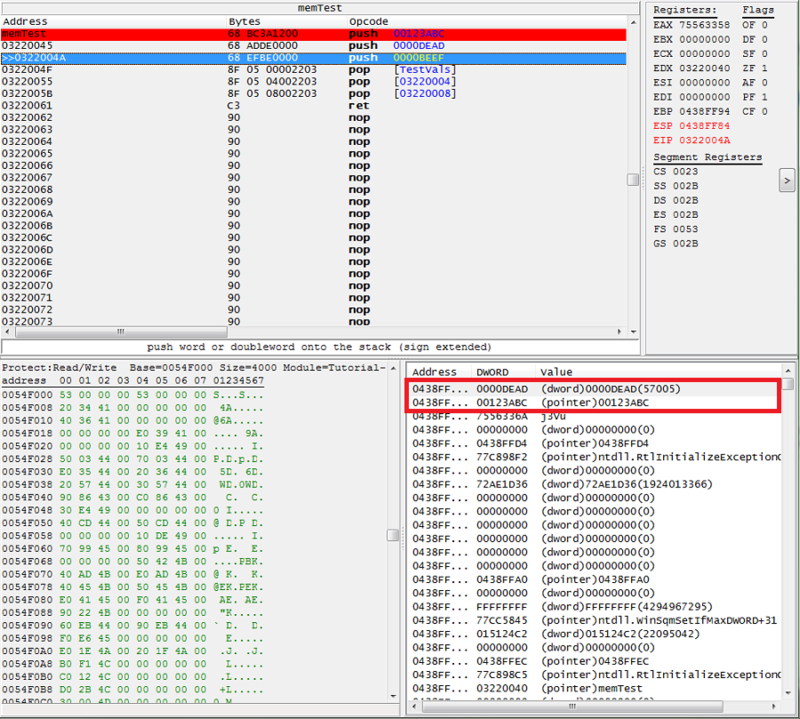 So let's set a breakpoint and watch the stack as we step though the opcode. 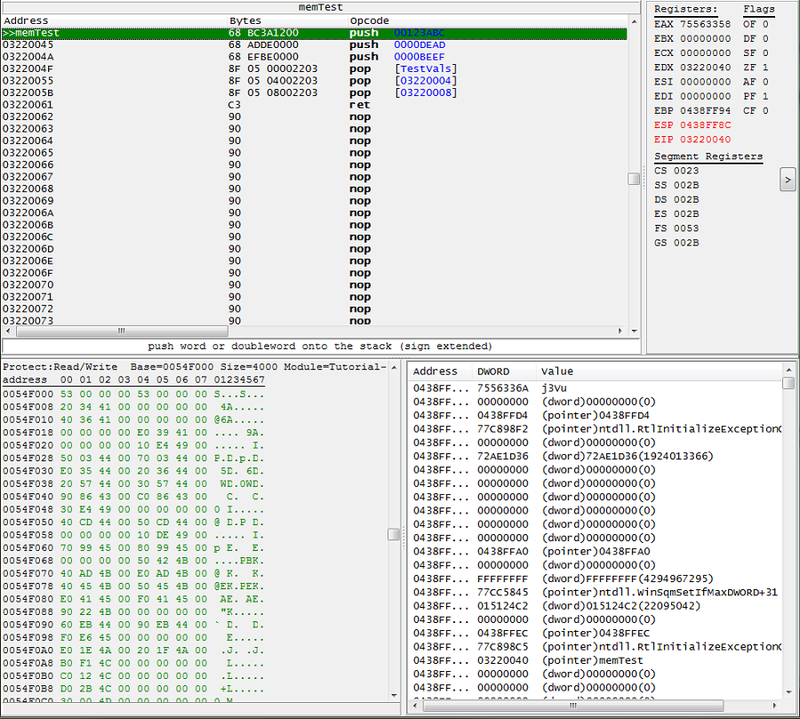 Note: You can select a line of opcode in the memory view form and press F5 to set a breakpoint. 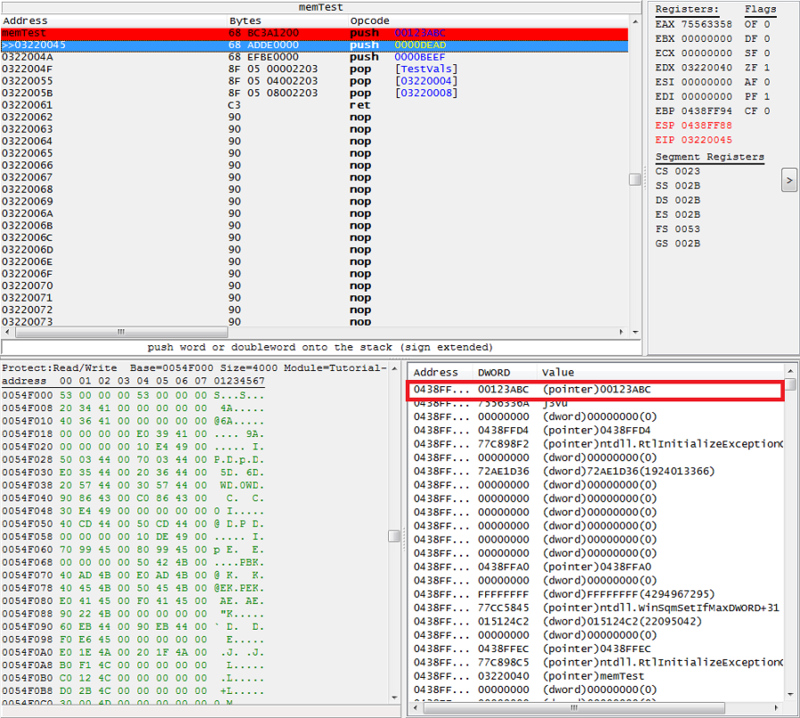 Note: Step though opcode in the memory view form by pressing F7, after a breakpoint has been hit. Note: to view the stack you may need to select it for viewing. So it's here that we start to see the values on the stack. And here we can start to see the values being popped in the reverse order that they were pushed. And that's really all there is to the basics of the stack. The thing to remember is that if you push in some injected code then you will need to pop in order to clean (or sanitize) the stack. We can PUSH and POP most registries, this is useful for saving and restoring stuff in injected code. 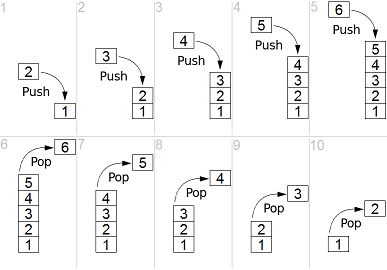 The x86 architecture has 8 General-Purpose Registers (GPR), 6 Segment Registers, 1 Flags Register and an Instruction Pointer. 64-bit x86 has additional registers. There is the PUSHAD and POPAD to save and restore all the generic registries. So the above code could just be written like this. Note: PUSHAD and POPAD are not available in 64 bit mode. 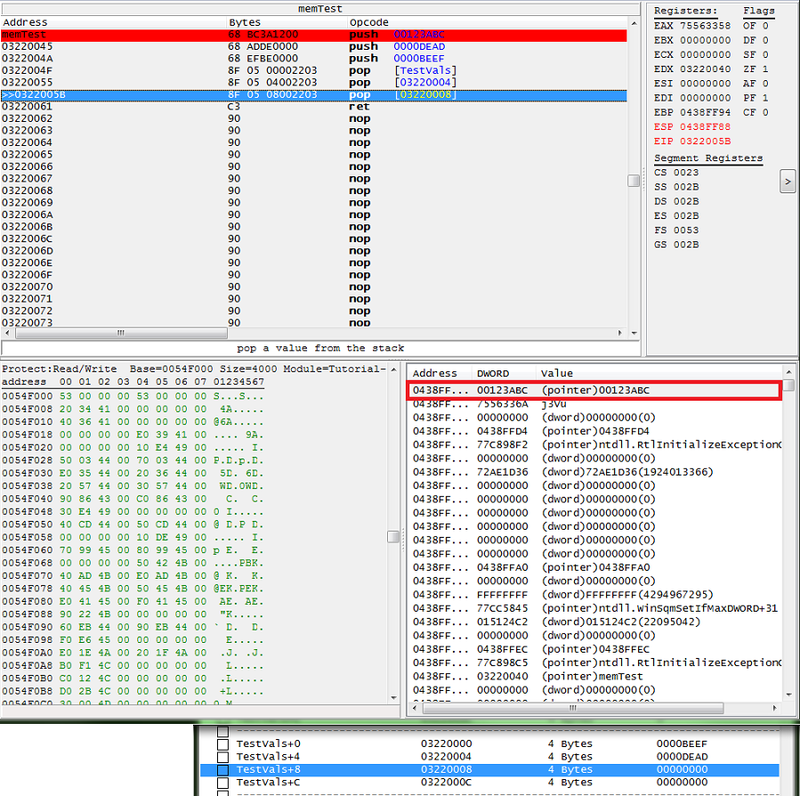 We can even PUSH and POP the Flags registry, using PUSHF and POPF (for 16 bit registry). 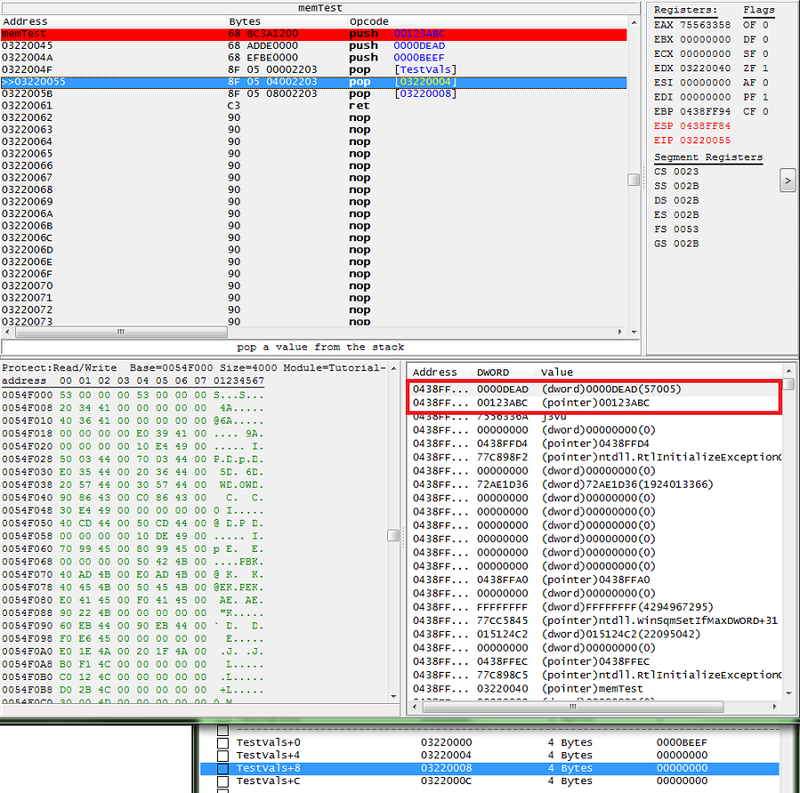 This allows us to save and restore the Flags when doing compares (conditional opcodes). The FLAGS register is the status register in Intel x86 microprocessors that contains the current state of the processor. This register is 16 bits wide. 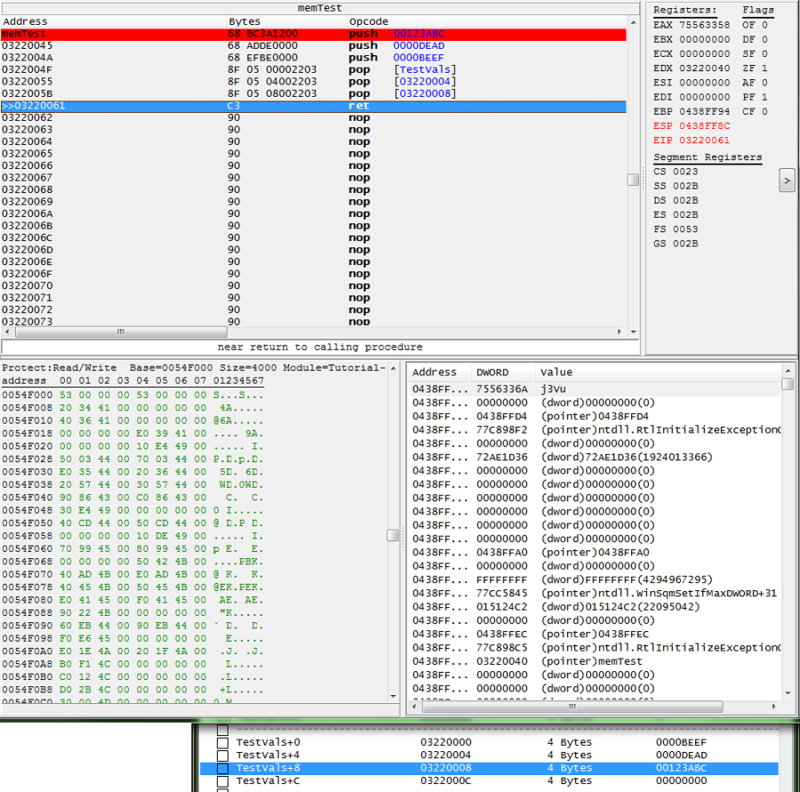 Its successors, the EFLAGS and RFLAGS registers, are 32 bits and 64 bits wide, respectively. The wider registers retain compatibility with their smaller predecessors. Note: when in 32 bit mode you should use PUSHFD and POPFD to manipulate the full 32 bits of the EFlags registry. 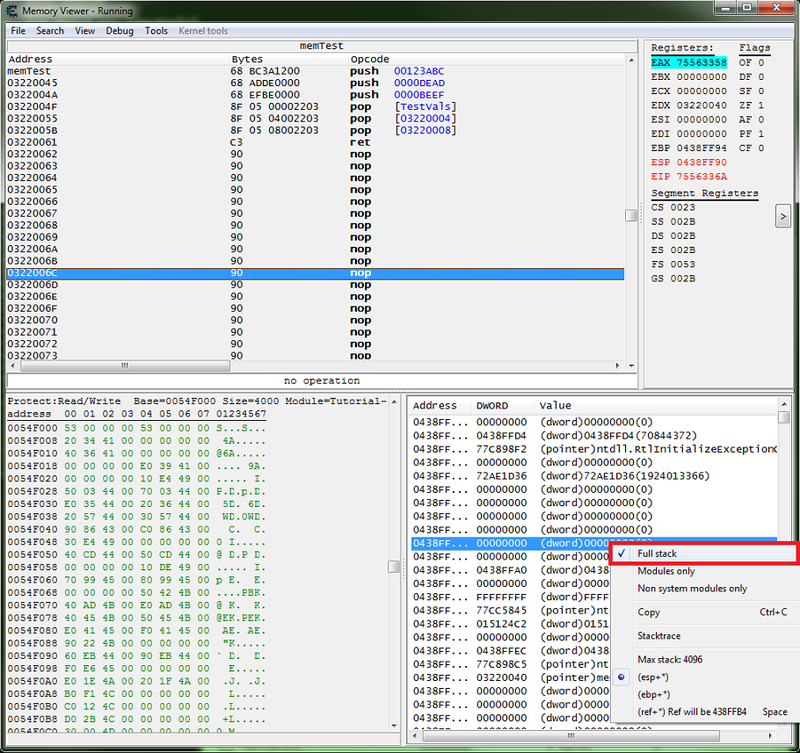 Note: when in 64 bit mode you should use PUSHFQ and POPFQ to manipulate the full 32 bits of the EFlags registry. Last edited by TheyCallMeTim13 on Sat May 12, 2018 5:59 pm, edited 3 times in total. The pop/push image at the start is a good candidate for "an image is worth a thousand words".